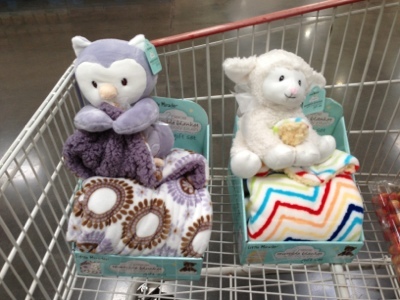 These Little Miracle stuffed animals with separate blanket were on sale at West Nashville Costco. I was going to buy one for the 1 year old granddaughter, but, instead, remembering sibling stuff, bought one for each girl. The 4 year-old granddaughter picked the lamb, leaving the owl for her 1 year-old sister. Later, the 4 year-old told me: "I love it!" Sometimes, we all need to be babied. On the Internet, I saw these sets offered for as much as $85.00 (ridiculous). I paid just under $10.00 each.